MAUNAKEA, HAWAIʻI –– Two of the world’s most powerful telescopes, located atop Maunakea, played a vital role in producing the world’s very first image of a black hole. 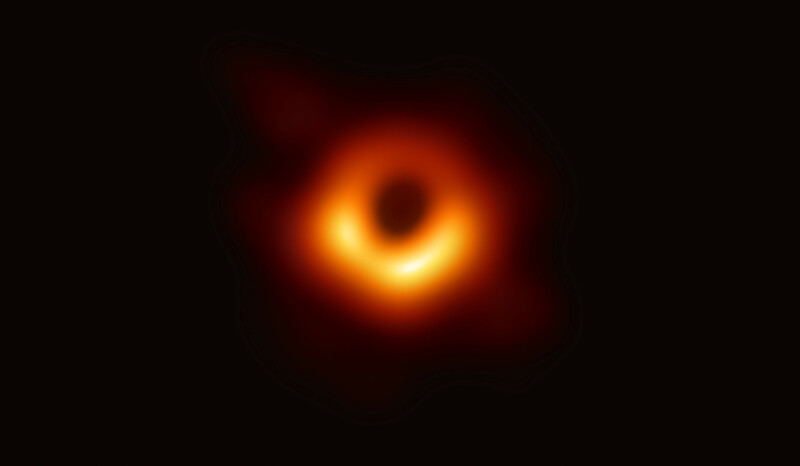 Hawai‘i-based James Clerk Maxwell Telescope (JCMT) and Submillimeter Array (SMA) are part of the unprecedented Event Horizon Telescope (EHT) project. JCMT is operated by the East Asian Observatory; SMA is operated by the Smithsonian Astrophysical Observatory and the Academia Sinica Institute of Astronomy and Astrophysics. In April 2017, a groundbreaking observational campaign brought together eight telescopes at six locations around the globe to capture an image of Pōwehi, a supermassive black hole at the center of the Messier 87 galaxy. Astronomers collaborated with renowned Hawaiian language and cultural practitioner Dr. Larry Kimura for the Hawaiian naming of the black hole. Pōwehi, meaning embellished dark source of unending creation, is a name sourced from the Kumulipo, the primordial chant describing the creation of the Hawaiian universe. Pō, profound dark source of unending creation, is a concept emphasized and repeated in the Kumulipo, while wehi, or wehiwehi, honored with embellishments, is one of many descriptions of pō in the chant. 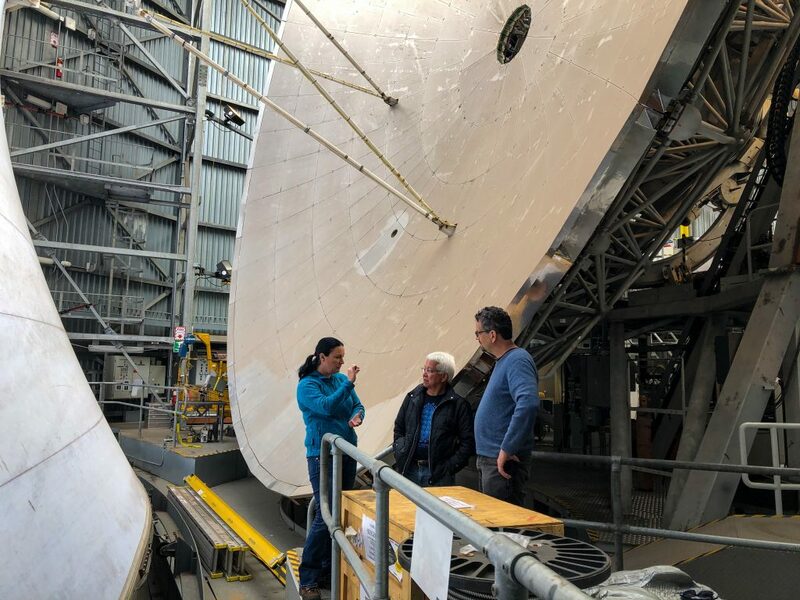 Dr Jessica Dempsey, Dr Larry Kimura, Dr Geoff Bower discuss the results at the JCMT, in front of the 15m dish. The SMA and JCMT telescopes are key members of the Event Horizon Telescope project, which links together strategically placed radio telescopes across the globe to form a larger, Earth-sized telescope powerful enough to see a Lehua flower petal on the moon. The participation of the SMA and JCMT as the far-west anchor point of EHT’s telescope array allowed astronomers to effectively observe and “photograph” supermassive black holes, among the most mysterious and powerful objects in the cosmos. Operated by the East Asian Observatory, the James Clerk Maxwell Telescope (JCMT) is the largest astronomical telescope in the world designed specifically to operate in the submillimeter wavelength region of the spectrum. The JCMT has a diameter of 15 meters and is used to study our Solar System, interstellar and circumstellar dust and gas, and distant galaxies. It is situated near the summit of Maunakea, Hawai‘i, at an altitude of 4,092 meters. The JCMT is operated by the East Asian Observatory on behalf of The National Astronomical Observatory of Japan; Academia Sinica Institute of Astronomy and Astrophysics, Taiwan; the Korea Astronomy and Space Science Institute; Center for Astronomical Mega-Science, China. Additional funding support is provided by the Science and Technology Facilities Council of the United Kingdom and participating universities in the United Kingdom and Canada. The East Asian Observatory also proudly partners with Vietnam, Thailand, Malaysia, Indonesia, and India. Click here for more information. The EHT collaboration involves more than 200 researchers from Africa, Asia, Europe, North and South America. The international collaboration is working to capture the first-ever image of a black hole by creating a virtual Earth-sized telescope. Supported by considerable international investment, the EHT links existing telescopes using novel systems — creating a fundamentally new instrument with the highest angular resolving power that has yet been achieved. This research was presented in a series of six papers published today in a special issue of The Astrophysical Journal Letters. More information on the Event Horizon Telescope can be found on the EHT website.